Interested in Applying for DGLVR Funds? Bevington Boat Access Demonstration project was a joint venture between Lawrence County, PA Fish and Boat Commission, and lead by the Conservation District for completion of a boat access and ramp. The access area was dedicated in memory of a local soldier, Allan Bevington who was killed during his service in Iraq in 2006. Allan and his brothers avidly fished the waterways in the area and it was a long time dream of Allan’s to have an access created on the river. 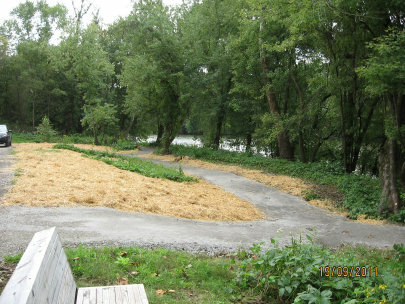 The first phase of the access area was completed in October of 2008 and is located on the Beaver River near Wampum. The first phase included installation of the parking area. 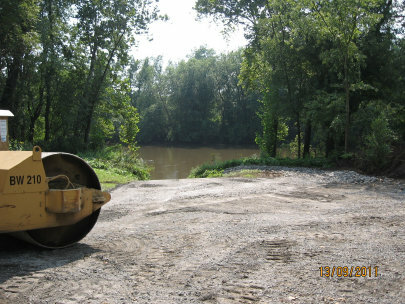 In 2009, maintenance of the first phase and tie in of the boat ramp into the river was finalized. In 2011, additional improvements were made to the access area. Repairs were made to the wearing surface of the parking area, additional drainage enhancements were added and an access trail was installed. Completion of the project provided several successful outcomes including emergency and recreational access. In addition, the site serves as a location to see a demonstration area that promotes the techniques used in the Dirt and Gravel Road Program.